Call Jim’s Mowing Canada on 310-5467 to book in a free quote. Or Book Online 24/7 here. Jim’s Mowing will rake the length and breadth of your lawn area, remove thatch, roots and stems, and enhance the health of your lawn. We recommend Power Raking for removing the thatch underneath your lawn. Power raking (or Dethatching) is a highly effective way to remove the accumulation of dead grass – often referred to as thatch – that collects under the surface of a lawn. Small mounts of are actually good as it can help the lawn surface be more resilient and maintain a more consistent soil temperature. However, when it starts to build up it can block air, water and nutrients from reaching the soil and therefore cause problems for your lawn. Too much thatch can cause the grass roots start growing on the thatch and not on the soil. Over time, the lawn starts looking lifeless and loses all its vigour. Is Power Raking Different to Core Aeration? Power Raking is an alternative to Core Aeration. In fact, deep power raking and core aeration are almost equally beneficial for your lawn, but which option will depend on the state of your lawn. We usually need to inspect the lawn before making the decision on which will be best for your lawn. If your lawn’s thatch becomes as thick as one and a half inches, we highly recommend Power Raking. However, if you have been aerating your lawn for quite some time now, you probably won’t need Power Raking at all. 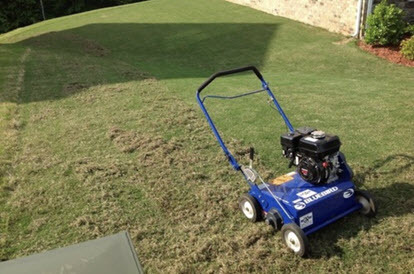 We can easily check the lawn condition and make our recommendation. When is the Best Time to Power Rake Lawns? Early spring and summer is usually the best time for Deep Raking your lawns. Or if it is a cool-season grasses, early fall is the ideal time. Fescue, ryegrass and Kentucky bluegrass are the main grass types falling under the category of cool-season grasses. If your lawn grass is Bermuda grass or zoysia grass, power raking in the late spring is the most sensible decision to take. For years, Jim’s Mowing has been providing specialized lawn care solutions in Vancouver and in the whole of Lower Mainland. Why Jim’s Power Raking Services? Jim’s Mowing team are professionally trained, fully insured and come with the famous 100% Satisfaction Guarantee from Jim’s Group. If you are worried about that thatch growing beneath the grass, call us on 310-5467 or Book a Quote Online. We can provide you with a written quote so you know the price before any work starts; what to expect and how soon you will see results in your lawn. We also provide professional landscaping, snow removal, fertilizing, gardening, lawn mowing, hedging, aerating, rubbish removal services, power raking and power washing services.